Straton watch co is a newish micro-brand in the watch world using Seiko and ETA movements in their own custom designed 70's inspired racing watches. All there models at release come with a choice of Seiko meca-quartz movements or an automatic and usually two case sizes. New, the quartz guys run about $500 and the auto’s about $1k, not chump change. But a little trick I learned, micro-brands tend to struggle to hold their value in the used market. New, this synchro auto was $1000, but with an eBay sale, I got this for a little less than $600, a steal considering the movement inside. As far as I know, this is the only Straton to use a Seiko automatic chronograph movement, the NE88. The rest use the ETA 7750. There is considerable debate in the watch world which is better. The Seiko NE88 uses a column wheel to activate the chronograph functions which doesn’t wear the gears as much at the 7750 cam driven wheels. It also keeps the seconds hand from jumping when the start pusher is depressed. Both run at 28,800 vibrations per hour. Now, watch snobs tend to turn their nose up at Seiko, and think the ETA 7750 is better, simply because it is a Swiss movement. Decades ago that may have been true, but Japanese movements (especially Seiko) are incredibly reliable, made to the same standards as Swiss (research Grand Seiko if you don’t believe me), cheaper to service, and in this case, the cost about the same. A no brainer to me and its a shame they use the 7750 now in the new models. Anyway, enough about my watch snob rant. 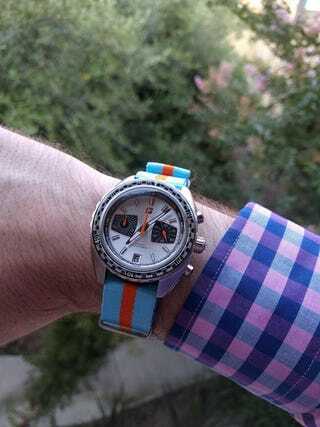 The watch came barely used, with both a very soft orange leather strap and a Gulf nato. I think they both look great. The other specs of the watch are incredible considering the price. 200m water resistance with screw down crown, unidirectional timing bezel, domed sapphire crystal, see through case back, and a gorgeous sunburst dial in oppo colors none the less! My only complaint about it so far the the height. With the timing bezel, domed crystal, it is about 15mm tall. In the world of automatic chronographs isn’t bad, and if you want it thinner, you’re paying some serious cash. So I won’t complain too loudly. Sorry for the lack of pictures, as I am wearing the blue Seiko Samurai in the second picture today and that’s all I have of the Straton! Anway, I highly recommend checking out their site, they have lots of models many oppos would enjoy!